A flag-raising ceremony on July 20 officially recognized the Cuban embassy found at 2630 16th Street, NW in Washington DC. as representing that country in the US. For fifty-four years the US and Cuba did not have formal diplomatic relations, and their embassies were bereft of official recognition for that time. As of the same date, the US embassy along the Malecón in the Vedado section of Havana is also now operating under the auspices of the State Department rather than as an Interest Section under the authority of the government of Switzerland. The official flag-raising in Havana will occur on August 14 when Secretary of State John Kerry visits the Cuban capital. The simultaneous announcement on December 17, 2014 by Raul Castro and Barack Obama that talks between Cuba and the US would begin the process to restore diplomatic relations between the two countries was a dramatic break with more than five decades of conflict that kept these two buildings from operating normally. A look at these two embassies and their histories gives a sense of how the two countries view themselves and each other during this period. The Cuban embassy is the older of the two buildings. The Cuban Legation, as it was called until 1923, when it was officially recognized as an embassy, had been in a brownstone mansion at 1529 18th Street NW from 1914 until 1917. The Cuban Foreign Minister, Dr. Carlos Manuel de Cespedes, wanted a larger building. He looked at lots along 16th St. NW in the Meridian Hill area. The woman developing real estate along 16th St was Mary Henderson, wife of former Missouri senator John B. Henderson. Henderson left Washington after one term in the Senate and returned to Missouri. There, he purchased local Missouri bonds, considered worthless after the Civil War, for a fraction of their cost and became rich when the courts forced their repayment at full value. With their new-found wealth, the Hendersons returned to Washington, where they established Meridian Hill as prestigious location to carry out their real estate business negotiations. Mary Henderson worked with prolific Washington architect George Oakley Totten, Jr. to build mansions, some of which were purchased as embassies. The Embassies of Poland at 2640 and Lithuania at 2622 16th Street continue in their original locations. The Cuban foreign minister, however, did not want to purchase a building constructed under the influence of Mary Henderson, who envisioned a five-story Elizabethan mansion to be designed by Totten. The Cubans purchased the property and hired the architectural firm of Macneil and Macneil to design a three-story structure in the style of Louis XV. Construction began in 1916 and the building reflected the popular classicism style of the École des Beaux-Arts in Paris, where Robert Macneil had studied. The design included a massive marble stairway rising from the first floor, where there were offices and the chancery. On the second floor there was a grand ballroom and rooms for dining and receptions. Above the atrium on the third floor was a stained glass window, bathing the embassy in light. It was “one of the handsomest occupied by diplomats in Washington,” according to the Washington Post. This building emphasized two aspects of Cuban identity that remain to this day: A pride in the Cuban nation and the significance of the United States to Cuba. The Washington embassy reflected the desire of Cubans to demonstrate their wealth and their importance as an American republic. But it also indicated that the Unites States was the most important country for Cuba. Over the years, both these aspects would be on display. In 1927 the president of Cuba, Gerardo Machado, came to Washington to meet with President Calvin Coolidge. The Cuban leader paid his respects at the US president’s home. Then Coolidge exchanged the favor to meet Machado at the embassy. By this time Cuba’s sugar prices had declined and decreasing prosperity meant US markets had come to be very important to Machado. In turn, the Coolidge administration did not protest Machado’s amendment for the Cuban constitution to allow it to allow the Cuban leader to continue in office for another term. Needless to say, US businesses in Cuba were pleased with the political stability promised by the arrangement. After the 1933 Revolution that ousted Machado from office, the US refused to recognize the interim government and welcomed the coup of Fulgencio Batista, who maintained good relations between the two countries. In 1938 Batista came to Washington and stayed at the embassy. Batista was invited to ride next to US Army Chief of Staff Mailn Craig in Washington, D.C. in an Armistice Day parade. Relations with Batista continued to have warm ties with the White House until shortly before his ouster by Fidel Castro in 1959. Castro also visited the Cuban embassy on 16th St when he came to Washington in 1959, although relations between the two countries deteriorated soon after that. Castro’s revolutionary policies alienated the Eisenhower administration and Cuba sought closer relations with the Soviet Union. After increasing confrontations between the two countries the embassies of the US in Cuba and that of Cuba in Washington were both closed in 1961. The Cuban embassy stood vacant, the property taken care of by Czechoslovakian diplomats, until 1977 when President Jimmy Carter negotiated with the Cubans to create Interest Sections under the authority of the Swiss embassy. There was one serious threat to the building in May 1979 when members of the anti-Castro group, Omega-7, planted a bomb at the embassy. There were no injuries and there was little damage. No one was ever apprehended for the crime. The Cuban government had begun remodeling the building several years before the December 2014 announcement that talks would proceed toward a reopening of embassies in Washington and Havana. 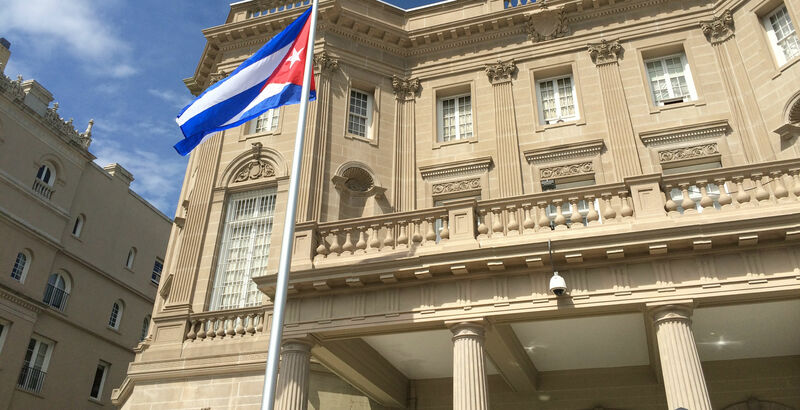 The building’s status as an Interest Section continued until July 20, 2015 when the Cuban embassy reopened with full diplomatic credentials. The importance accorded to this building and its status by the current Cuban government indicates the continuing significance of an official Cuban presence in Washington. The US embassy in Havana before 1953 was a four-story building on Obispo Street in Old Havana, not far from “El Capitolio,” Cuba’s Congress at the time Due to the deteriorating neighborhood and limited space, the embassy was relocated to the seaside boulevard, the Malecón, in Havana’s fashionable Vedado neighborhood. The prestigious architectural firm of Wallace K. Harrison and Max Abramovitz was chosen to design embassies in Rio de Janeiro and Havana. They had been involved with the design of Lincoln Center and the United Nations buildings in Manhattan and the Avila Hotel in Caracas. Harrison and Abramovitz created a seven story rectangular office block with a raised first floor to protect it from storm surges. The glass tower encased in reinforced concrete slabs stood tall among the apartment buildings of the seaside neighborhood, with the Atlantic Ocean as its backdrop. The building perhaps was designed to impress Cubans with the wealth of the US through its Italian travertine tile, native coral and heat-resistant glass. Belgian steel, French furnishings and British office partitions indicated that the post-WW II US was a world power and controlled resources around the globe. 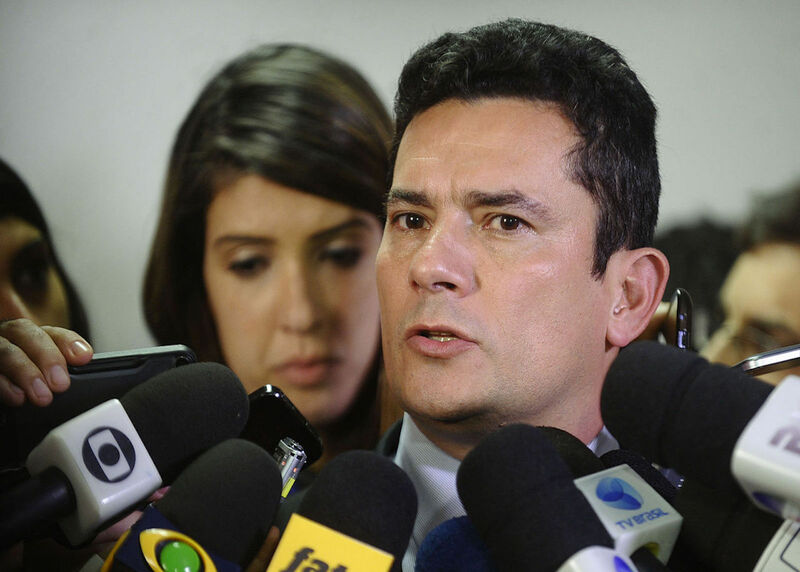 It also suggested, although perhaps not intended by the architects, support by the US for the government of Batista, who had retaken power in a military coup in 1952. 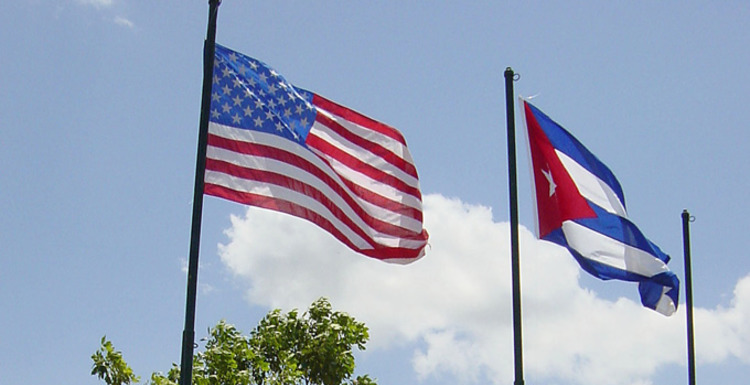 United States Interests section in Havana/Cuba with flagpoles. From: Escla, Wikimedia Commons. The triumph of Fidel Castro and the initiation of his revolutionary regime led to a breach in Cuban-American relations. The US embassy in Havana was closed in 1961 and remained under the protection of the Swiss government until 1977 when the US Interest Section opened as part of the Swiss Embassy. The sixteen years with no diplomatic contacts reflected the abiding enmity between the US and Cuba, with US-sponsored attacks on Cuba and assassination attempts against Castro and Cuban support for revolutionary movements throughout Latin America and Africa. From 1961 until 1977 there were no US diplomats in Cuba. The Swiss had agreed to take responsibility for the building and for US interests on short notice. The Swiss ambassador to Cuba, Walter Bossi, was told of the agreement on January 5 and the parting US diplomats handed him the keys to the embassy two days later. The Swiss had more to do than maintain the building. There were several tense moments when US-Cuban relations threatened the property and its occupants. In February 1964 the Cuban government decreed that the US embassy was to be seized and turned into the Cuban Ministry for Fishing.Cuban officials showed up at the building and demanded that the Swiss turn over the property. This action was in response to the recent arrest of Cuban fishermen in US waters. The Swiss ambassador protested vehemently, declaring that such action by Cuba was not permitted by international conventions and that he would personally bar the door to keep them from taking possession. The other dramatic event occurred in May 1970 when Cuban exiles seized two Cuban fishing boats and took their crews prisoner. Havana Radio broadcasts incited Cubans to demonstrate and they laid siege to the embassy, preventing anyone from entering or leaving. The stand-off lasted three days until the Cuban fishermen were released. In 1977 US president Jimmy Carter attempted to open a dialog with Castro about better relations. There was an agreement to allow each country to send diplomats to an Interest Section. In Havana these diplomats would replace the Swiss by taking over day-to day tasks of representing the US, while still formally part of the Swiss embassy. The US sent ten State Department officials and a non-uniformed Marine guard. US diplomats were not allowed to travel about Cuba without permission from the Cuban government, and Castro often denounced the US for using the Interest Section as a way to fund opposition groups. This bellicose relationship continued for more than thirty years as very little changed, although the building received major renovations in 1997, indicating that the US was going to maintain its visible presence in Havana for a long time. An embassy is a physical embodiment of the nation it represents. Its location, design and function are intended to fulfill the goals of one country in its relations with another. It also demonstrates some of the characteristics of that nation. In the case of Cuba, the fashionable neighborhood, classical design and beauty of the embassy suggest a Cuba that is proud and desires to show itself as equal to the country where it resides. 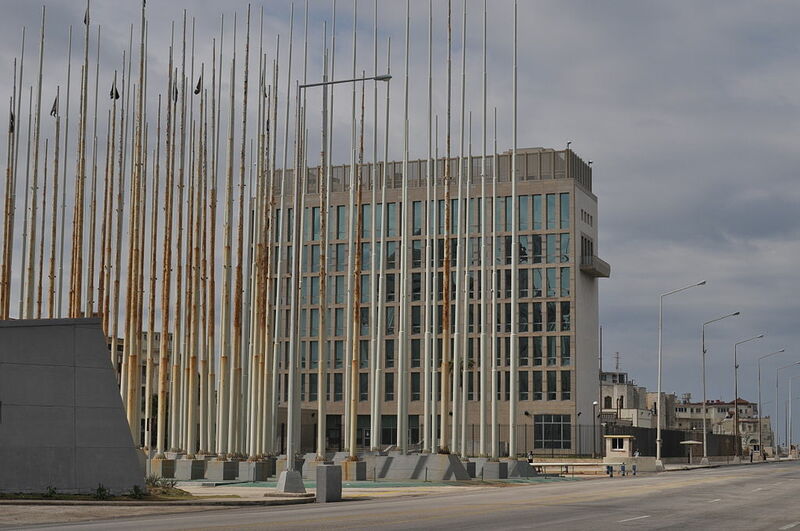 The US embassy in Havana, moved from center city to a spectacular location along the famous Malecón, stands as a glass and concrete monument to wealth and power. These two buildings have withstood many decades of political and physical neglect. Now that they are full-fledged embassies and their diplomats have greater privileges, what goes on inside undoubtedly will have a greater impact on broader relations between the two nations. Featured Photo: Cuban Embassy in D.C. From: Robert Craven. Inset Photo: United States Interests section in Havana/Cuba with flagpoles. From: Escla, Wikimedia Commons. Thomas Fischer, “Talking to the Bearded Man: The Swiss Mandate to Represent US Interests in Cuba, 1961-1977,” Working Papers in International History and Politics, No. 5 / August 2010, 14.